The package from Dog & Hat with Hundred House and Quarter Horse. Is it a particularly contemplative dog with the monocle? Links with science can be found everywhere, from the café to the coffee roaster. 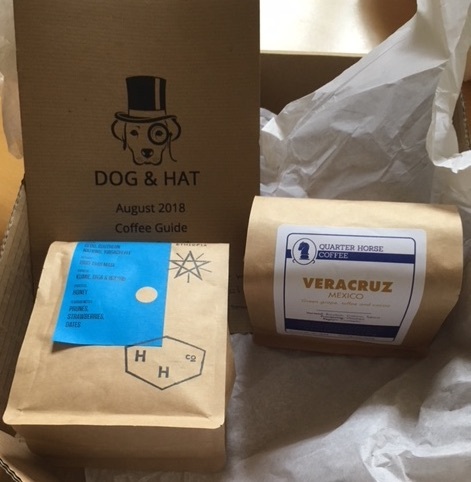 A couple of weeks ago a delivery from Dog and Hat coffee gave me an opportunity to explore the random thought paths that may occur if you stop to ponder your coffee at home rather than in a café. 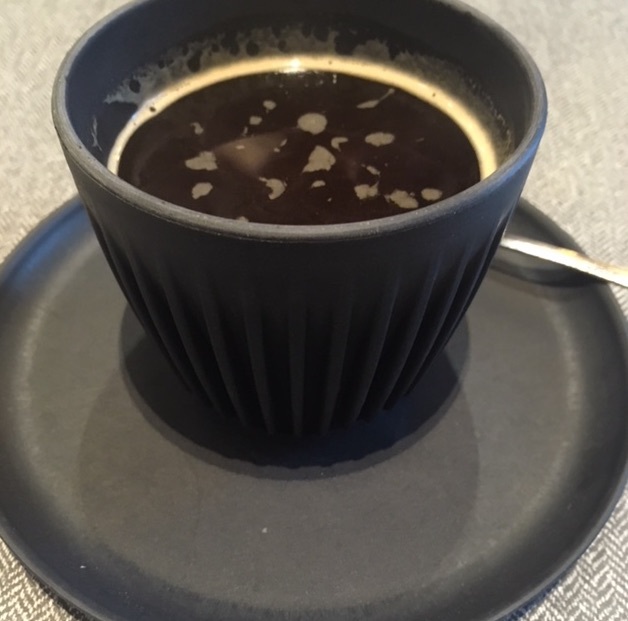 The first coffee, an Ethiopian from Hundred House prompted thoughts on star gazing. But the second coffee, a Mexican from Quarter Horse coffee was equally thought provoking. 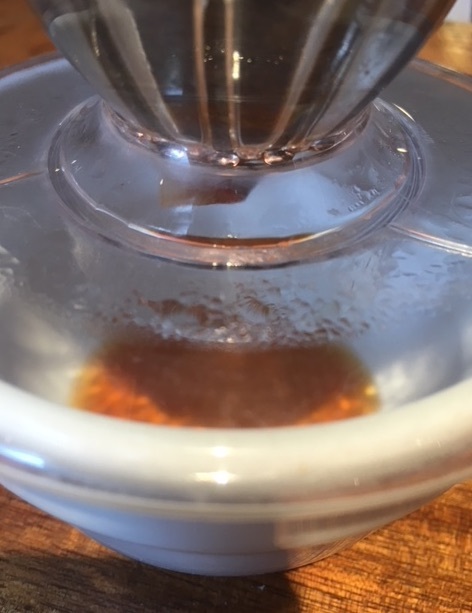 Finding time to prepare a V60 and sit with the SCAA “flavor wheel” as a guide, I was rewarded with a sweet, well rounded and perfectly enjoyable brew. I found fruity notes of blueberry and cherry/pineapple though the tasting notes on the packaging say “green grape, toffee and cocoa”. Sadly I missed the cocoa but this offers a good excuse for another slow brew with the coffee wheel at hand. Thinking about the name of the coffee, I started to consider how you could quarter a horse. Perhaps not a literal horse given the ethical considerations but rather an irregularly shaped volume. How would you divide, into equal portions, an irregularly shaped object such as a horse? It seemed related to the question of finding the shortest route between two locations, how would you calculate the best route to take from A to B? In the 1950s a computer scientist called Edsger Dijkstra (1930-2002) came up with an algorithm to calculate precisely this problem. Originally designed to show the shortest routes between 64 cities in the Netherlands, Dijkstra’s algorithm is now ubiquitous in our lives. 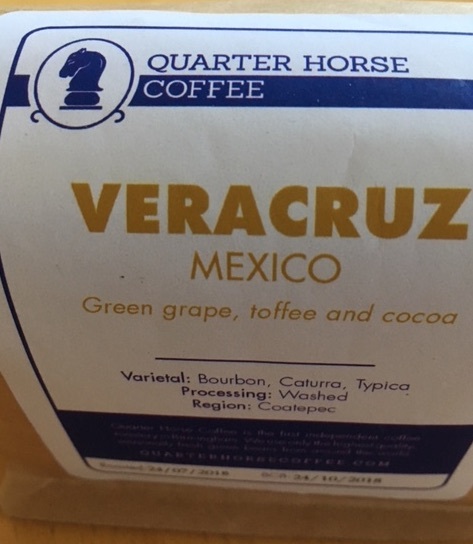 A close up of the Quarter Horse Coffee Bag. One of the ways in which we have started to rely on such algorithms is in car GPS devices or even on our phones trying to navigate to our destinations. Or at least, many of us do. London taxi drivers however have been shown to have developed a different brain structure from the general population that means that, for them, Dijkstra’s algorithm may be unnecessary. A few years ago, a study compared brain scans of people who had been driving London’s “black cabs” for a number of years to those of us in the general population. A follow-up study followed three sets of people over several years. A control group of people in the general population and a second group of people who studied the “Knowledge”, the navigational test that London taxi drivers have to pass in order to become cabbies. The Knowledge tests the driver’s ability to recall tens of thousands of London’s streets and the prospective cabbie can be asked to navigate between two points anywhere within a 6 mile radius of Charing Cross. Typically it takes years to acquire the Knowledge and not everyone who starts on the Knowledge will pass (the pass rate is only about 50%). This means that this second group of people splits into two groups; those who studied and passed the Knowledge and those who studied but did not pass. The studies proved illuminating. One particular part of the brain, the posterior hippocampus had a greater volume of “grey matter” (the brain processing cells) in taxi drivers who had studied, and passed, the Knowledge compared with the general population. Moreover, those that had been taxi drivers for longer, showed larger posterior hippocampi. The changes in the brain seemed to lead to the cabbies having not only better navigational ability than the general population but better memory for London based information. The study of the trainees moreover confirmed that these brain changes occurred as a result of learning the Knowledge, showing that our brains are adaptable and still able to develop well into adulthood. While the brains of all the study participants started off similarly, those that went on to pass the Knowledge had a larger posterior hippocampus than those who either didn’t study or studied but hadn’t passed. However it was not all good news for the cabbies. The growth of the posterior hippocampus seemed to occur at the expense of the anterior hippocampus in long serving taxi drivers (but not newly qualified ones). The improved memory for London based information shown by the taxi driving group was also accompanied by a poorer ability to learn other visual information/memory related tasks in those that passed the Knowledge compared to the general population. London black cab drivers have been shown to have a larger volume of grey matter in the posterior hippocampus area of their brains, demonstrating that our brains remain adaptable well into adulthood. 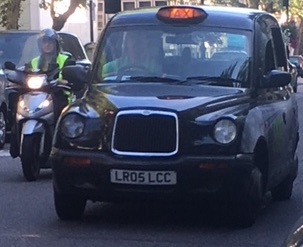 Perhaps the ability of the cabbies to navigate quickly around London’s streets suggests a second connection with Quarter Horse. A Quarter Horse is a breed of horse that can sprint very quickly over short (less than a quarter of a mile) distances. Which goes faster, the cabbie with the Knowledge or us with our smartphones once we have plugged in our destination? We are reminded of the tale of the hare and the tortoise. But I think a different tale is more appropriate. A tale that in reality was only ever a snippet of an ancient saying but has been developed into tales by thinkers such as Isaiah Berlin and Ronald Dworkin. “The fox knows many things but the hedgehog one important thing”. What does this mean? 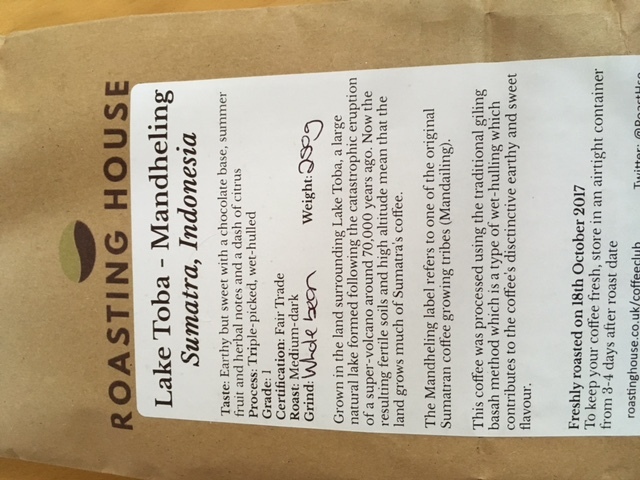 It seems there is a connection here between coffee roasting and taxi drivers, between algorithms and personal development, between coffee science and writing about coffee science. Is this connection really there or is it a meaningless statement that leads us into blind alleys of coffee consideration? It may be time to stretch our brains, grow our grey matter a bit and contemplate. Am I a fox or a hedgehog and where do London cabbies and coffee roasters fit in? You can read more about the taxi driver study on the Wellcome Trust’s press release about it here. Enjoy your coffee, have fun thinking, grow your grey matter. Redemption Roasters Cafe on Lamb’s Conduit St.
At the top end of Lamb’s Conduit Street there is an unassuming café in a fairly modern building at the corner of Long Yard. 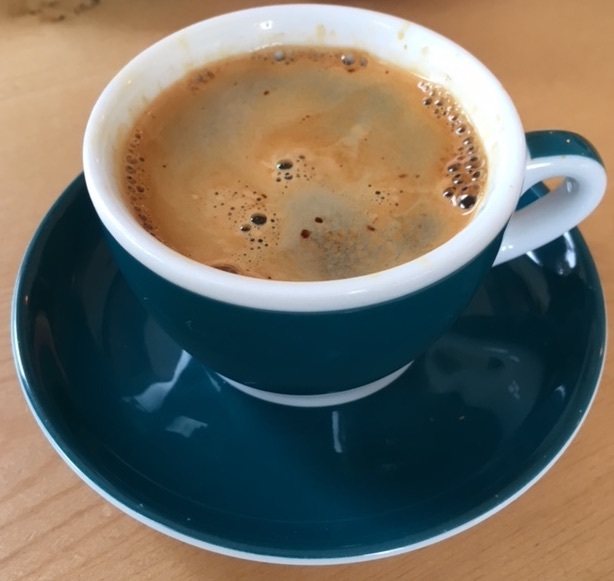 In recent weeks I had been hearing a lot about Redemption Roasters and their café. First came the review by Double Skinny Macchiato, then various comments on Twitter, in Caffeine magazine and finally, an article in the FT. In an ideal world, it seems to me that cafés can act as seeds towards forming a better society. Local and independent, a friendly place where you can chat with the baristas (or café owners), and so where communities can form and develop. 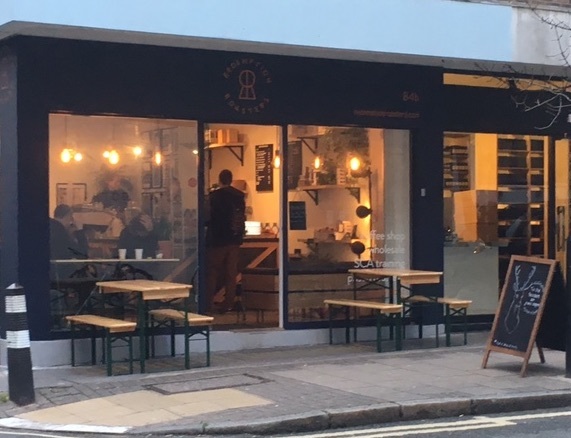 All that I had heard about Redemption Roasters café fitted, in some way, into this ideal which meant that it was not going to be long before I headed towards Bloomsbury and tried this new café. Plenty of seating could be found inside the café, with tables of two or four and benches around the space. The counter was immediately in front of us as we went through the door and the friendly barista took our order (long black and soya hot chocolate, what else?) while we took our seats. There were a fair few staff in the café when we visited, so many in fact that we weren’t initially sure who were staff and who were customers. Nonetheless, their joviality transformed the café’s fairly austere decor more into the feel of the welcoming space of a living room. A layered hot chocolate? No, just the reflection of the saucer in the glass. Having taken our seats and started to look around, we found that much could be said about the science in this café. From the SMEG refrigerator and individual radiators to the light reflection off individual sugar crystals in a glass on the table. 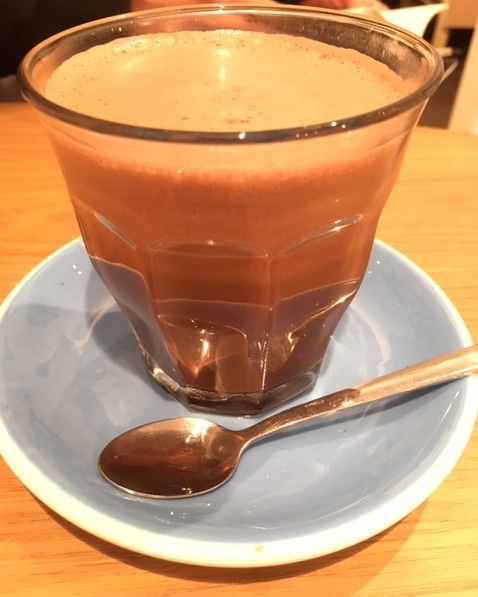 Moreover, when our drinks arrived, the reflection of the (blue) saucer in the hot chocolate glass made it appear as if the hot chocolate were layered. In fact it was an optical illusion caused by the way our minds process the colour blue in shadows, more on that in this great article about colour, Goethe and Turner. But it was to a different lighting effect that my thought train eventually turned. Above the counter are a series of hanging lights with angular shades over them. Above our table were LED bulbs inset into the ceiling. 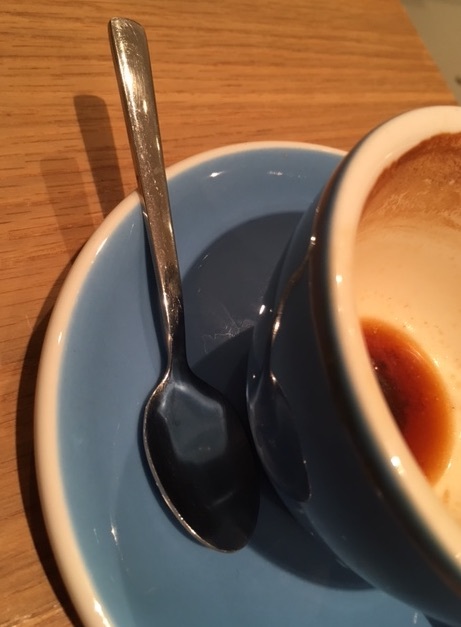 The way that the LEDs above us had been placed produced two shadows from the spoon on the saucer of my cup. A dark shadow and a light shadow at a slightly different angle. One reason that LEDs have caught on as a light source is that they are more efficient and so better environmentally and cheaper financially. So you may think that LEDs are one way of reducing our (collective) environmental footprint. But does this work? According to a study that measured the outdoor light levels around the world from 2012 to 2016, the answer is no. It would appear that while on a local level, people are enjoying cheaper lighting, on larger scales (nationally, globally), this decreased cost is leading to us installing more lights. Consequently, on the global scale, the area of land that is lit has increased by 2.2% per year with very few countries showing a reduction or even a stabilisation of the amount of outdoor areas that are lit. Determining a presence by noticing an absence. The two shadows of the spoon came from the light bulbs inset into the ceiling. Does this matter? Well, it is something that is affecting us, the way we view our world and the wildlife that we share our planet with and so it is something that we ought to be thinking about. In brightly lit areas of the UK, trees have been shown to produce buds up to 7.5 days earlier than in darker areas. 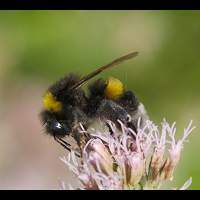 Artificial light is causing problems for nocturnal insects and animals, with knock on effects for crop pollination. And when was the last time you looked up at the sky on a clear night and saw seven of the Pleiades let alone the Milky Way? How does it change our psychology and philosophical outlook when we can no longer gaze at the night sky with wonder and without the glow of streetlights? Some astronomers have called for increased shielding of street lighting as a way for us to both enjoy well lit streets and be able to enjoy looking up at the night sky. 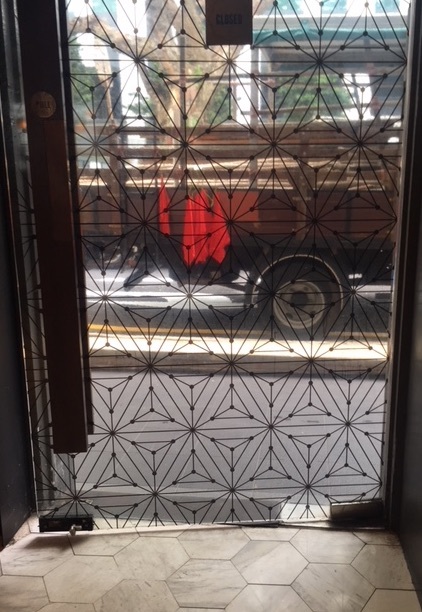 Shielding such as that over the lights over the counter at Redemption Roasters café, where the light is efficiently directed downwards rather than be allowed to escape into the sky. Small steps that can make a big difference. It is interesting to notice that around central London at least, many newer lampposts are more efficiently shielded than older ones. Pausing for a coffee in Redemption Roasters café is a great moment to consider this problem and your reaction to it. Have you stopped to gaze at the night sky recently? 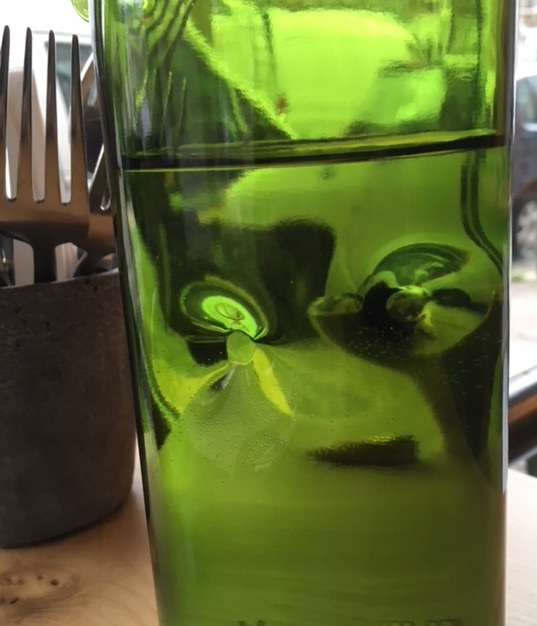 After leaving the café, I realised I had lost an opportunity to notice something else. 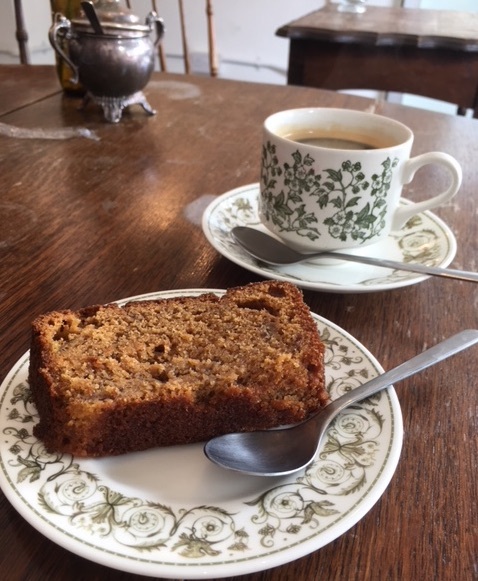 Frequently, after visiting a good café, I will look up the area in my London Encyclopaedia¹ to see whether there is anything of interest historically in the area of the café. As expected, Lamb’s Conduit St was named after a conduit made from a tributary of the river Fleet restored by one William Lamb in 1577. But Lamb also donated 120 buckets for poor women of the area to use for collecting their water, which explains the statue of a woman with an urn at the top of the street. However what was also mentioned was that at the entrance to Long Yard (ie. very close to Redemption Roasters) there is an ancient stone inset into a wall with a description about the Lamb’s Conduit. Somehow I missed this though Double Skinny Macchiato evidently found it. So if you do visit Redemption Roasters café, and I would very much recommend that you do, as well as taking some time to savour the coffee and to notice the surroundings, please do look out for this elusive stone and if you find it, do let me know. 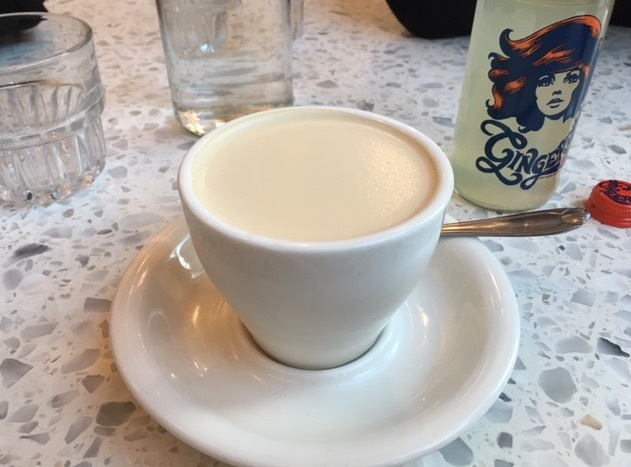 Soya latte and a ginger beer at Spike and Earl. 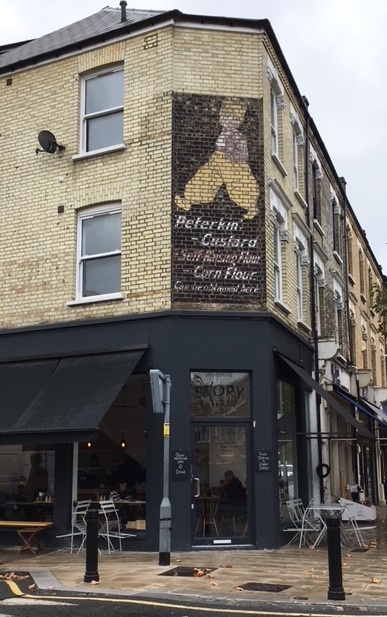 A few months ago, news came that the coffee roasting company Old Spike had opened a new café, Spike and Earl, down in Camberwell. 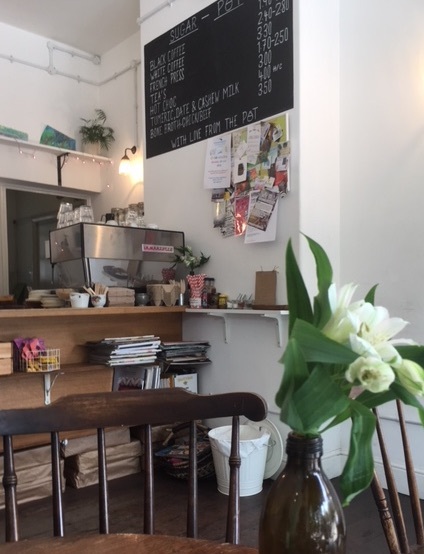 Operating on similar principles to Old Spike, Spike and Earl aims to serve excellent coffee (and food and cocktails) with a social conscience. By employing those who have previously been homeless, Spike and Earl offers an employment (and training) route for people who may not easily otherwise have the opportunity. So although Camberwell is a bit of a trek, I was looking forward to trying this new place. As it was a late afternoon in November and the menu suggested that the dairy alternatives were only soya or oat, I decided to try a soya latte. (For any reader with a nut allergy, the current fashion of using almond milk means that you should always ask first if your cappuccino contains nuts). 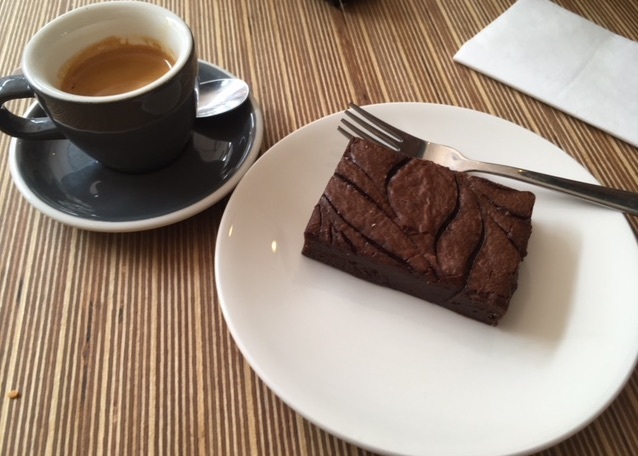 The baristas were friendly and confident in assuring me that they do not use almond milk (no danger of nut-cross contamination) but that their brownies did contain nuts (so I sadly had to pass on the brownie opportunity). My partner in these café reviews opted for a ginger beer. There were a series of high tables with stools on the left hand side of the café. Presumably many people can therefore be accommodated when it gets crowded. 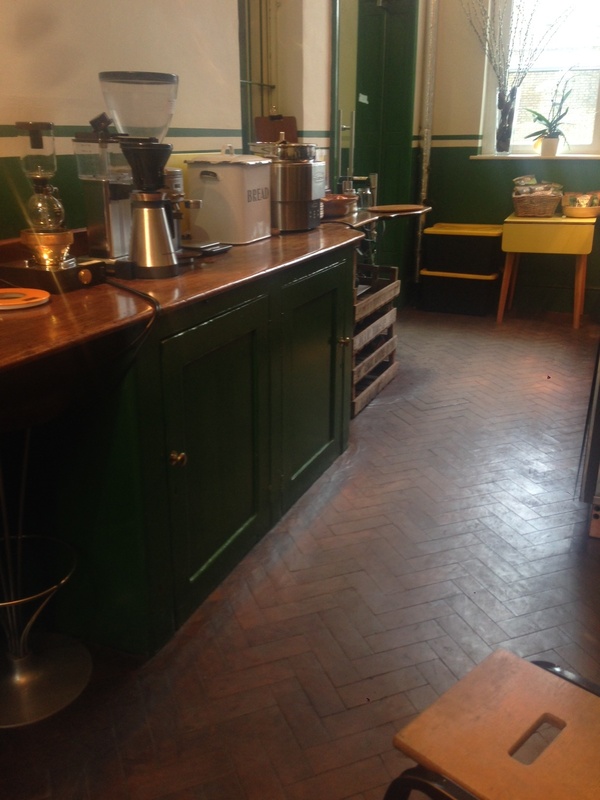 However, at the time of our visit, it was fairly empty and we made our way to the rear of the café. Behind us, and behind closed glass doors, was a coffee roaster that we later discovered was part of the Old Spike roasting expansion. It’s always a nice touch to see coffee roasting happening as you drink but perhaps we needed to arrive earlier for that. Holes in bricks at Spike and Earl. Just a foot-hold or a suggestion for a great piece of engineering? Drinks arrived together with complementary water and the soya latte was very smooth. Almost caramel like in the sweetness and very drinkable. It makes a pleasant change to have a latte once in a while. Light was playing tricks around the room as the sun was setting and the inside lights were becoming more prominent. But the striking thing about Spike and Earl was that the bricks used to support the tables and line the walls all had holes in them. 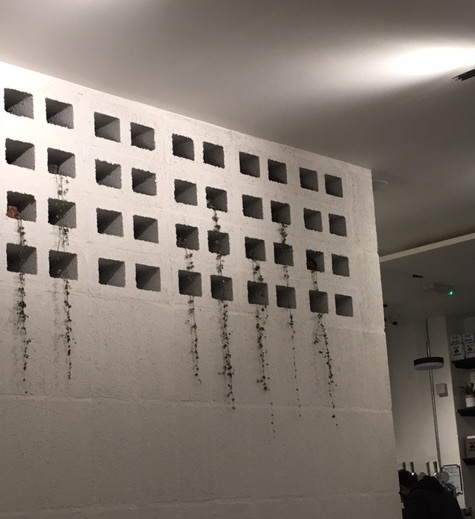 On the wall running along the side of the café, (windows were on the other side), pot plants were placed in the holes giving the impression of the beginnings of a green wall. 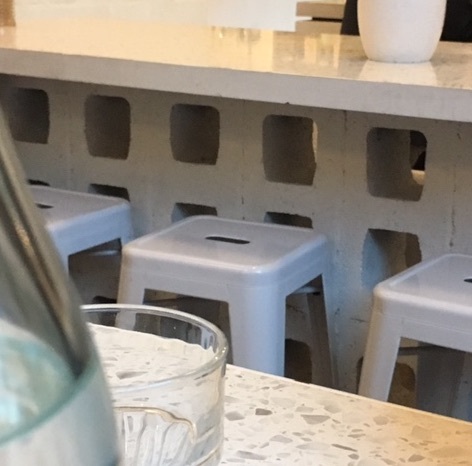 The holes in the bricks supporting the table meanwhile made an excellent footstool and were complemented by holes in the stools. A latte of course is largely made up of holes, or at least bubbles. The foam structure consisting mostly of air. 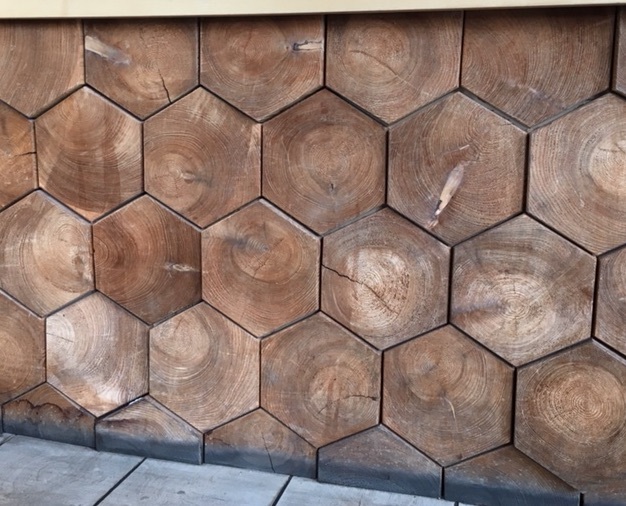 How is it that some structures can be made better owing to what they don’t contain rather than what they do? For example, if you imagine the difference between a latte and a cappuccino (but made out of metal rather than milk) that can be the difference between a successful tooth implant and a failure. We know from our coffees that bubble size can have a significant structural effect. But how about more fundamental properties, can the holes in bricks change things such as the way sound propagates? More bricks with holes at Spike and Earl, this time with some plants escaping from them. The start of a green wall? You may have heard about how different structures can be engineered to make materials “invisible” to certain frequencies of light. Imaginatively named “invisibility cloaks” are made by designing materials with patterns on them that change the path of an incident light beam. Because the effect on the light beam is due to the structure in the material rather than purely from the material itself, these materials have become known as ‘meta-materials’. When you remember that microwaves are a form of light, it is perhaps easy to see some of the applications of this research and one reason that it has attracted a lot of funding. However there is an acoustic type of metamaterial that is far more similar to the bricks in Spike and Earl and that may find applications in medical imaging (ultrasound). Earlier in 2017, a team from the universities of Sussex and Bristol published a study about acoustic metamaterial ‘bricks’. Each brick had a differently shaped hole through the centre of it which delayed the incident sound wave by a specific phase interval (you can say it ‘slowed’ the wave). In order to work efficiently, the brick had to be of a height equal to the wavelength that the researchers were interested in and a width equal to half that wavelength. As they were investigating ultrasound, the bricks were therefore about 4.3mm square and 8.66 mm high. 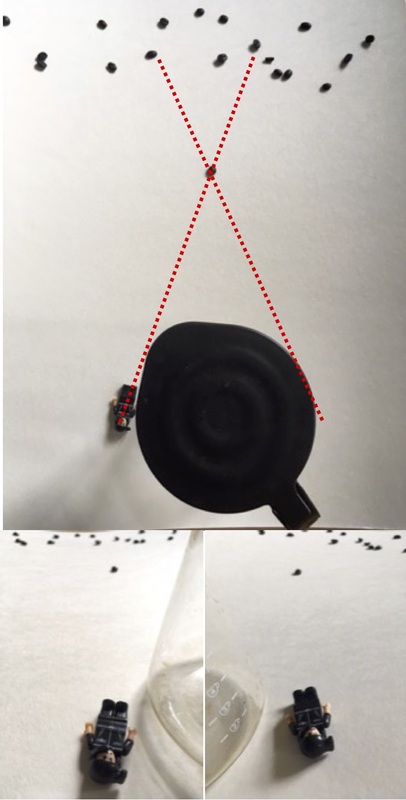 By assembling the bricks together, the researchers found that they could steer a focussed beam of sound or even change the shape of the sound beam. This would have applications as diverse as targeting cancer cells with ultrasound to levitating a polystyrene bead. You can read more about their research here (or, if you have access to Nature Communications, their paper can be downloaded here). Layering at the end of my soya latte. What would you think about? Which is the musical note C#6 (with an explanation of nomenclature here). As I finished my soya latte, strata of milk lined the cup. 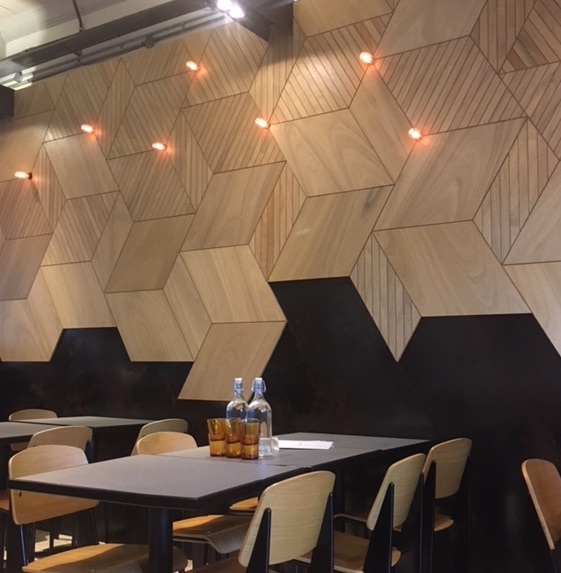 Reminiscent of the Earth’s layers or perhaps, metaphorically, our strata of understanding, there is certainly plenty more to ponder at this interesting new(ish) addition to the London café scene. So next time you are in Spike and Earl, do let me know what you end up thinking about, you never know where these thought trains may take you. 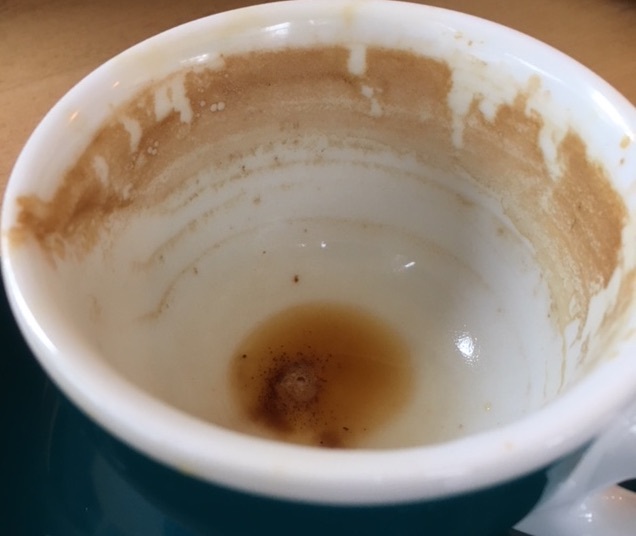 Ever considered the connection between your morning brew and a century old technique that, it is fair to say, revolutionised analytical chemistry? The opportunity to do so finally arrived and I prepared a V60. First measuring out the freshly ground beans, rinsing the filter, watching the bloom, then slowly pouring the remaining freshly boiled water onto the grounds, all the while noting the aroma. 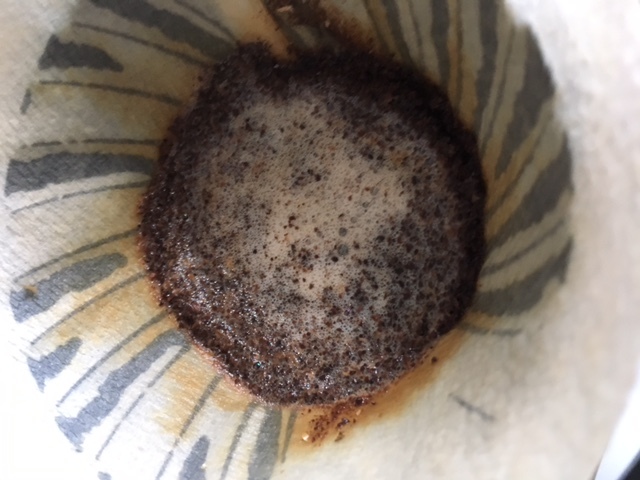 Taking this opportunity to slowly prepare (and appreciate) a coffee, I noticed that some of the soluble elements in the coffee climbed the filter paper during the pour. A few hours afterwards, the paper had gained a circular rim of coffee solubles around the top of the paper. Although in many ways quite different, this effect was very reminiscent of the technique of chromatography. 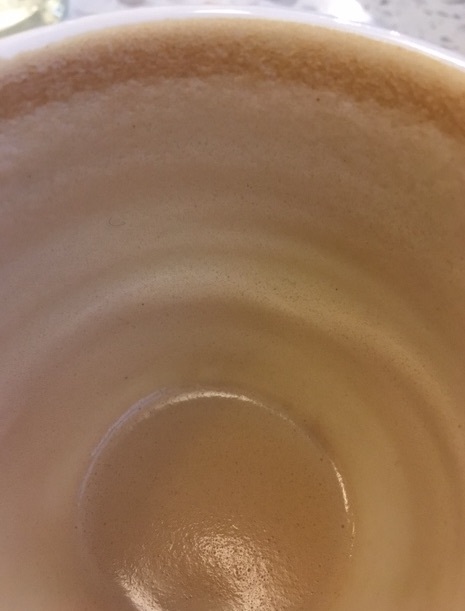 The coffee in question. What tasting notes would you get if you slowed down and tried this one? The biggest difference between the behaviour of the V60 filter and “paper chromatography” is that in the former, the bottom of the filter paper is continuously immersed in both the sample (coffee) and the solvent (water). In chromatography on the other hand, a drop of the sample (e.g. coffee or ink) is put onto the filter paper which is then placed in a solvent (e.g. water, ethanol). Different components within the sample travel different amounts up the filter paper depending on how soluble they are in the solvent and how they interact chemically with the filter paper. So different components will travel different distances up the filter paper before they get stuck while the solvent continues to travel up the paper. 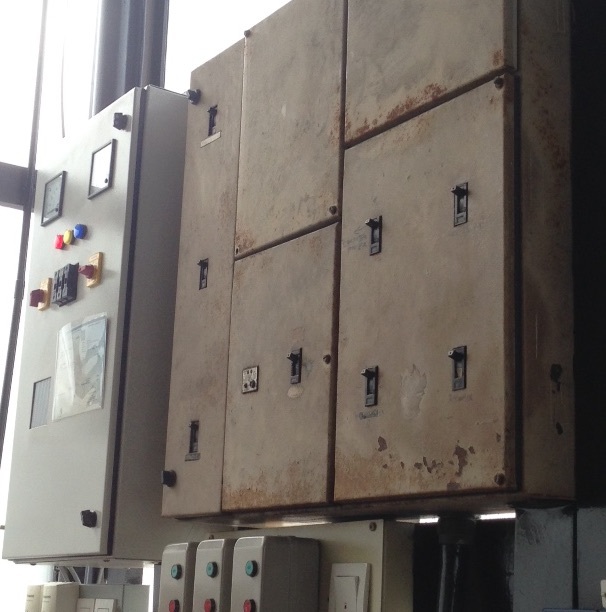 All else being constant, each component always travels a certain distance relative to the solvent and so this provides a way of separating chemical components ready for further analysis or identification. Perhaps you remember using chromatography to separate the colours in an ink pen at school? The ink was spotted onto a piece of filter paper and then immersed in water. We watched as it separated into various colours illustrating the number of different dyes that had been used to make up the ink. When used professionally though, the chromatography technique can be used to investigate trace impurities in soil, air, drinking water etc. It has even been used to analyse the components in coffee. From something that can be done in school science, it is an incredibly powerful chemical technique. What was surprising was that the technique of chromatography was not invented until 1903, while the idea of using paper in chromatography only came about in 1944¹. Those who first used chromatography as a method to identify chemicals (in plants), did so using columns of powder rather than paper. Paper chromatography was invented to investigate the separation of amino acids and specifically was used to understand the composition of the antibiotic tyrocidin¹. Just as the ink in our school experiments separated into different dyes, so the chemicals that they were investigating would separate into different components, different chemicals would stay at different heights on the filter paper. A few hours later and the coffee had travelled up the filter paper with the solvent (water). Much more descriptive than my effort. It seems I need to return to my V60 and improve my tasting ‘chromatography’. There are so many ways to slow down and appreciate a good coffee, what do you notice in yours? A ‘coffee tasting wheel’ can be found here if you, like me, would like to improve your coffee tasting ‘chromatography’. 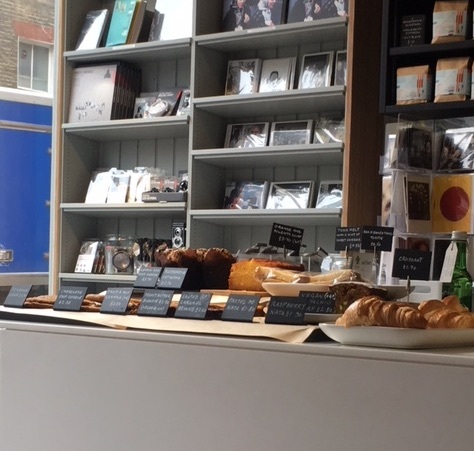 There are many great cafés in London serving excellent coffee but inevitably a few stand out. One such café is Coffee Affair in Queenstown Road railway station which ‘inhabits’ a space that really encourages you to slow down and enjoy your coffee while just noticing the environment. An ex-ticket office that whispers its history through subtle signs on the parquet floor and in the fixings. The sort of place where you have to stop, look around and listen in order to fully appreciate it. And with a variety of great coffees on hand to sample, this is a café that is a pleasure to return to whenever I get the opportunity. So it was that a few weeks ago, I happened to wander into Queenstown Road station and into Coffee Affair. That day, two coffees were on offer for V60s. One, an Ethiopian with hints of mango, peach and honey, the other, a Kenyan with tasting notes of blackcurrant and cassis. But there was an issue with them when they were prepared for V60s. The Ethiopian, “Gelana Abaya”, caused a considerable bloom but then tended to clog the filter cone if due care was not taken during the pour. The other, the Kenyan “Kamwangi AA”, did not degas so much in the initial bloom but instead was easier to prepare in the V60; there was not such a tendency to clog. The samples of ground coffee imaged under an optical microscope at 5x magnification. Kamwangi is on the left, Gelana on the right. “500 um” means 500 micrometers which is 0.5 mm. Fluorescence microscope image of the two coffees at 10x magnification. Note the open structure in the Kamwangi and the more closed structure in the Gelana. A fluorescence microscope image magnified 20x – not ‘um’ means micrometers (1/1000 of a mm), so the scale bar represents 1/10 mm. So there is perhaps a clue in the cell structure. 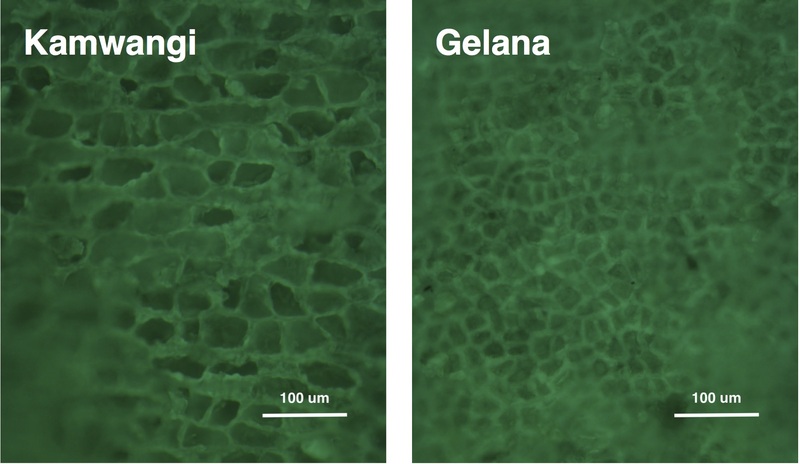 It seems as if the Kamwangi structure is more open, that somehow the cells in the Kamwangi break open as they are ground but the Gelana somehow keeps its cells more intact. Could this be why the Gelana blooms so much more? Which naturally leads to a second experiment. 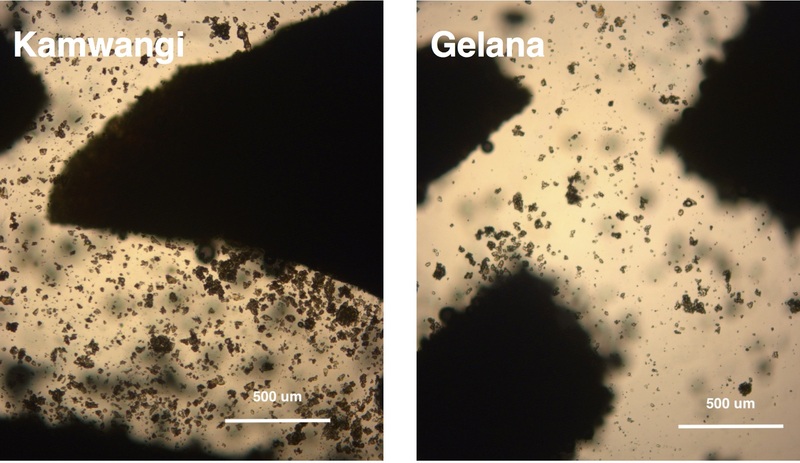 What happens when you look at these two coffees in water under the microscope? Here the fluorescence images didn’t help as all you could see were the bubbles of gas in each coffee but the optical microscope images were of more interest. ‘Bits’ broke off the Kamwangi as soon as water was added but in comparison, there were far fewer bits of coffee breaking off the Gelana grains. So what do you think has happened? 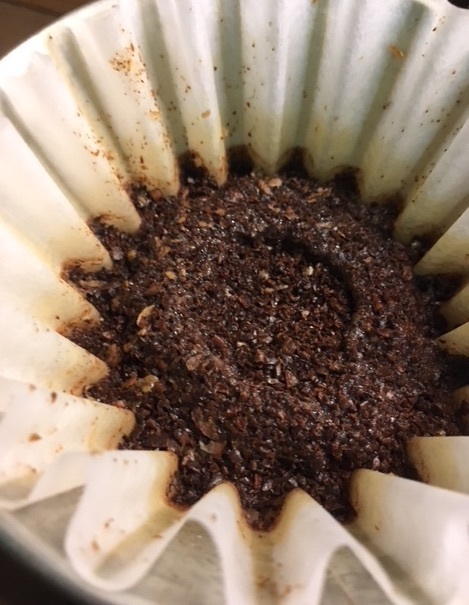 If you remember our question was: when these two coffees were prepared with a V60, the Gelana bloomed a lot but then clogged in the filter (without extreme care while pouring the filter). Meanwhile the Kamwangi did not bloom so much but also did not clog the filter, what could be happening? 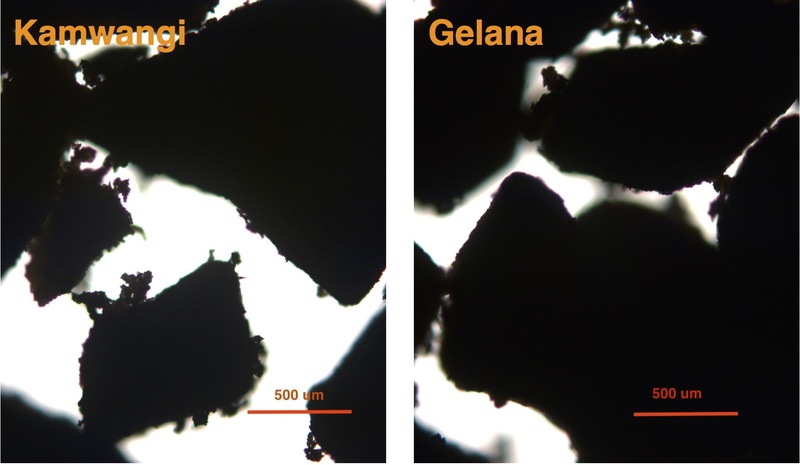 Before adding any water, the cell structure in the Kamwangi is more open, the Gelana appears ‘closed’. When water is added, there are many more ‘bits’ that come off the Kamwangi whereas the Gelana does not show so much disintegration on the addition of water. If pushed for a hypothesis, I wonder whether these two observations are linked. What is happening is that the cell structure in the Kamwangi is, for whatever reason, fairly fragile. So as soon as it is ground, the cells break up and a lot of the carbon dioxide is released. Consequently when water is added to it, the bits of broken cell quickly disperse through the water and it doesn’t seem to ‘bubble’ that much. 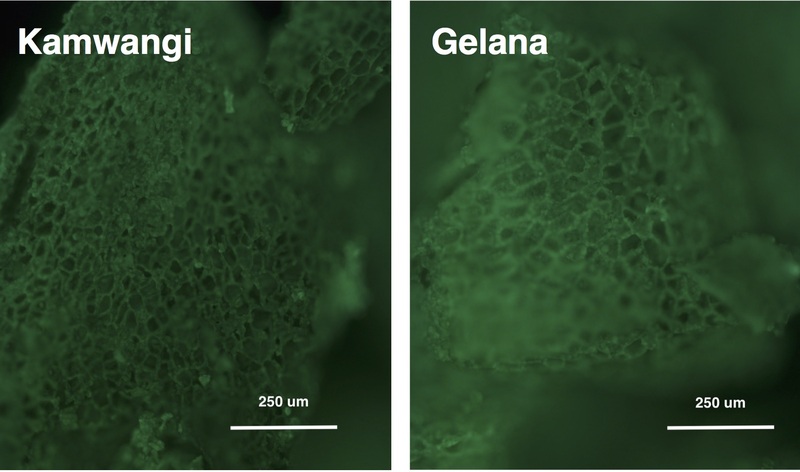 In comparison, the Gelana cell structure is tougher and the cells only open up when water is added. I wonder if this means that the ground Gelana coffee will swell rather than break up and so ‘jam together’ as each grain tries to expand rather like trying to inflate many balloons in a bucket. They will push against each other and prevent water from easily percolating through the ground coffee. Sadly, many more experiments would be required before we could see if there’s any truth in this hypothesis however that does provide a great excuse, were one needed, for many return trips to Coffee Affair. Meanwhile, what do you think? Do any of the images stand out to you and why? 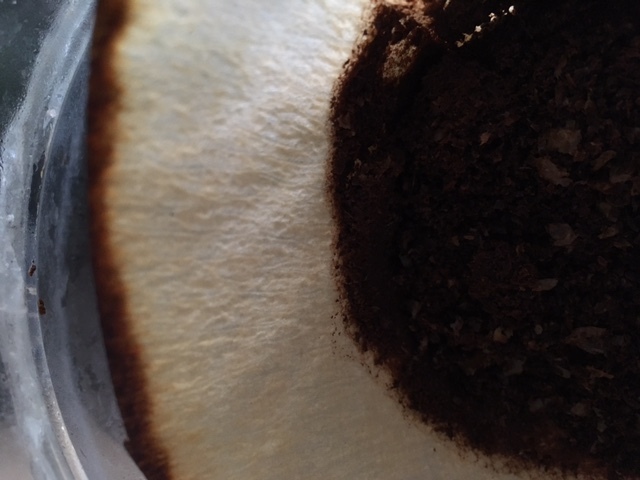 What do you think could be the cause of our V60 coffee mystery? I’d love to hear your thoughts so please let me know either here in the comments section (moderated and experiencing a lot of spam at the moment so please be patient), on Facebook or on Twitter.